Honeysuckle is one of our more annoying invasive shrubs. 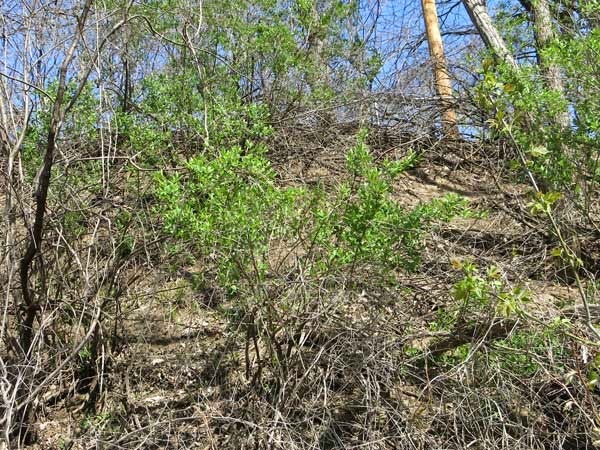 However, it is one of the first shrubs to green up in the spring, thus making it easy to spot. Thus, now is a good time (if you have all your burns done!) to seek it out and eradicate it. Honeysuckle is a multi-stemmed shrub with a fairly shallow root system. In contrast to many other shrubs, it does not form rhizomes. Thus, there is no connection between one shrub and the next. However, every stem that is viable must be dealt with, and larger shrubs often have 15-20 stems. With either procedure, it is essential to add a dye to the herbicide mixture. With the cut and treat method, you end up with a lot of biomass that must be stacked and eventually burned. With basal bark, you just leave the plant intact and watch it die. Eventually, the dead stems will dissipate, or burn up during next year's burn. For cutting a small infestation, hand loppers can be used, but for large infestations, a motorized brush cutter is preferable, provided there are enough crew members to follow the brush cutter and treat all the cut stems. (A skilled brush cutter can keep three or four people busy treating. With either technique, it is essential that every stem be treated with herbicide, otherwise the plant will regenerate from the untreated stem(s). One advantage of the basal bark technique is that if you come across another invasive shrub, such as blackberry or sumac, you can treat that as you go. Today our intrepid crew burned the wetland strip, thus finishing our burn program for the spring season. 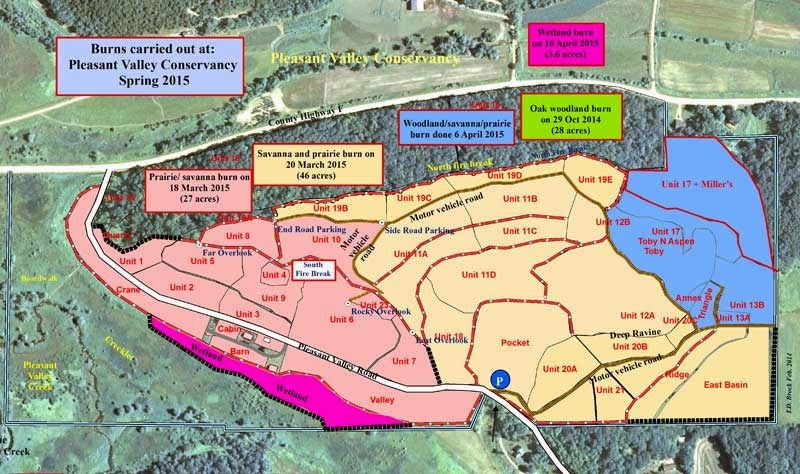 The map shows the area (3.6 acres) burned. For more details on the burn program at Pleasant Valley Conservancy, and an 18-year summary of burns, see this link. This has been a challenging year for us to do burns because of the permitting system under which we have to work. There have been a number of low-humidity days during which we are not able to burn, although folks outside of the state-controlled areas could (and did) burn with impunity. See the text below this map for a discussion and some comments on burning under low-humidity conditions. 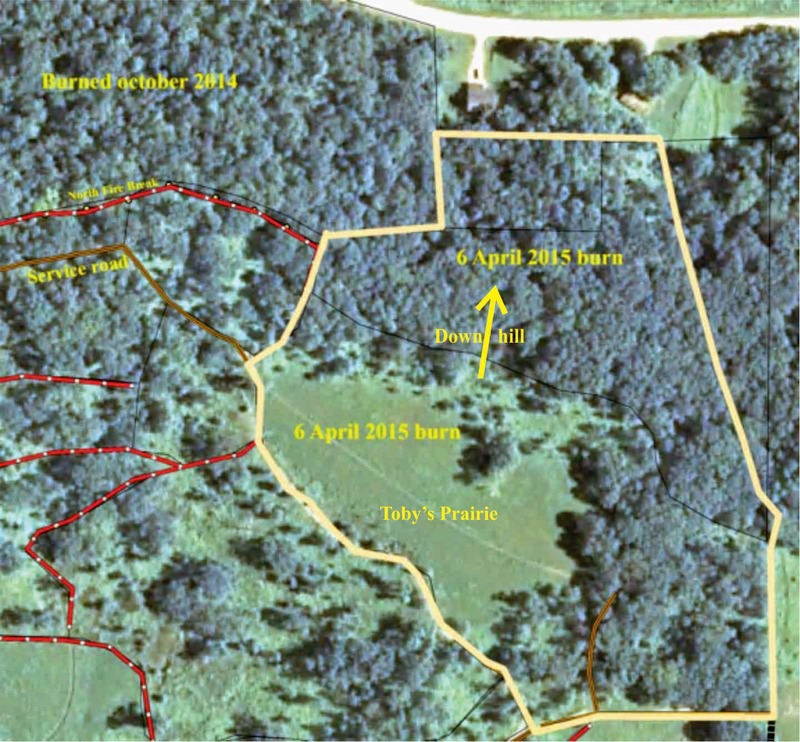 This map shows the extensive burn program that was accomplished in spring 2015. For more details on prescribed burns at Pleasant Valley Conservancy, access this link. I've been trading e-mails with some fellow prescribed burners about burning in the recent low-humidity conditions. I'd like to open up the topic to the group, and maybe add some nuance to the discussion. I'm taking a little flak about my decisions to burn the past two days, so I want to give a little background. Why would a prescribed fire practitioner even consider burning when the humidity is below 20%? Doesn't that violate your prescription? Isn't it irresponsible? On Tuesday afternoon we burned two small units. One was about 2 acres, half good tallgrass (fuel model gr6) and half bluegrass/fescue (fuel model gr3), with a high point in the center. I measured 75 deg, 25% rh, and light wind 1-2 mph, with a Kestrel 3000. The unit burned nicely, pulling in to the high point, and smoke went straight up as desired. The fire was mostly flanking, the head fire behavior was 15' flames and 120 ft/min rate of spread, well within prescription. The other unit was less than a half acre, no more than 50' across at any point, and was burned with backing and flanking fire with flame lengths under 8'. These units were well suited to burning with light winds and the fire behavior was by no means extreme. I found out later that the Madison airport was measuring 14% rh when I measured 25%. Measurement accuracy is another lengthy topic but I think that fire behavior is the bottom line. On Wednesday we had multiple units to burn at a site on the north side of Lake Mendota. We finished a couple units in the morning with a minimum humidity reading of 33%. At 13:00 I measured 25% rh, the Madison airport was reporting 20%. We burned a 3.5 acre unit with tallgrass (gr6) and cattail/sedge (gr8). The backfire in the gr8 fuel was 8' flames and 50 ft/min spread rate, headfire was 15' flames and 100 ft/min, again well within prescription. The next unit was a 9-acre gr6 unit. Measured rh was 27%, Madison airport reporting 17%. Wind was 4-7 mph. The crew was thoroughly briefed on the red flag conditions, the low rh readings, and the observed and expected fire behavior. We decided to go ahead, and burned the unit with primarily flanking fire, with 3-8' flames. We did send some head fire when we had over 100' of black downwind, and had 15-20' flames with 150-180 ft/min spread. That's pretty big fire but still within prescription and less than we often see in tallgrass with higher humidity and more wind. All of the units we burned Tuesday and Wednesday afternoon had very good firebreaks, with little or no receptive fuel downwind. I never felt that we were taking any excessive risks in burning these units, and never felt that the fire behavior was threatening. I'm not saying that everyone should blithely go out and burn no matter how low the humidity, but it is possible with the right burn units to burn responsibly at these conditions. It turns out that 2014 was a good year for acorn production by bur oaks. What is called a good "mast" year. However, it was only now, after we had completed our savanna burns, that I was able to see the heavy acorn layers under the bur oaks. Bur oaks drop their leaves early in the fall, and by the time I started looking for acorns last fall, they were all covered up. It was only yesterday, after the leaf litter had been burned up, that I was able to see the acorns under the bur oaks, especially in Units 8 and 10. Last year was also a good mast year for red oaks. See last October's blog for details. As that blog discussed, the mechanism by which masting is controlled in oaks remains a mystery. 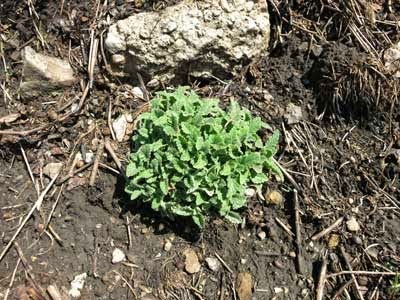 Many perennial weeds come up early, since they overwinter as dormant buds. Right now weeds such as catnip, motherwort, reed canary grass, smooth brome grass, and Canada thistle are already visible, and are lush enough that they can be sprayed. The best herbicide is glyphosate (used at 2%), since it has no soil residual. We used to think that we could eradicate these perennial weeds by pulling or digging, but soon discovered that this did not work. The reason is that these weeds have extensive root systems and therefore resprout. You can't get all the plant by pulling or digging! 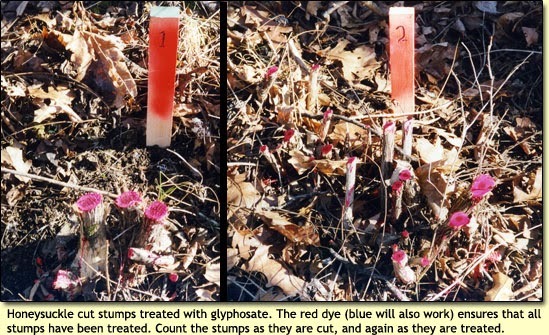 I strongly recommend using glyphosate at this time of year, because most of the ground is still bare. Since glyphosate is inactivated by soil particles, it has no effect on the soil itself. Anything green will be killed, but anything still underground will not be. However, timing is critical. By next week lots of "good" species will be up, so it is important to be able to recognize what you are spraying. Good plants to watch out for (and might already be up in sunnier areas) include (among others) golden Alexanders, shooting star, native thistles, Trillium, and columbine. Two more major burns done! Due to Amanda's initiative and the skilled help of Integrated Restorations, Monday 6 Apr 2015 we managed to carry out two more major and complicated burns. At Pleasant Valley Conservancy (PVC) we burned 10 acres of oak woods, 3 acres of Hill's oak savanna, and 5 acres of prairie. The woods are on a north-facing hill just downhill from the prairie (see air photo/map). Most of this woods had never been burned, and was the last piece of unburned property at PVC. This woods, which we call Unit 17, consists of a ridge between two shallow gullies. According to our tree database, the principal trees are species of oak: black oak, 93 (20 over 20" in diameter); red oak, 77 (3>20"); and white oak 164 (19>20"). Also 63 cherry plus scattered trees of other species. This woods is shady enough so that invasive species such as buckthorn have never become established and has never been logged. The woods to the east of Toby's Prairie, which we call Unit 13, consists mostly of white oak with a small area of Hill's oak, all mostly less than 80 years old. This area had probably been logged because at the time of the 1937 air photo it was mostly open land, except for one large open-grown white oak. A fire break had been blown around the periphery of the woods. The fuel in both of these wooded areas is almost exclusively oak leaves. Because of the relatively dry conditions, the fire carried fairly well. 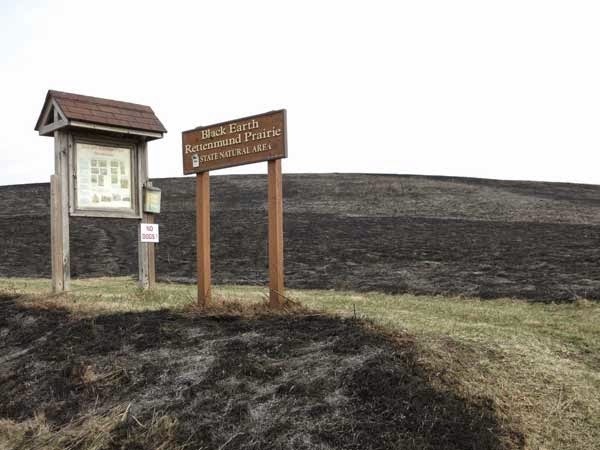 Toby's Prairie has been burned annually since it was planted in 1998 and always burns well. Area of the Monday burn at Pleasant Valley Conservancy. This is at the far eastern end of the Preserve. We had a short lunch after completing this burn and then moved on to Black Earth Rettenmund Prairie, about 3 miles away. As the map below shows, we did two separate burns, leaving the Saddle area unburned. The fire breaks separating the burn units from the Saddle were wide tractor-mowed strips. 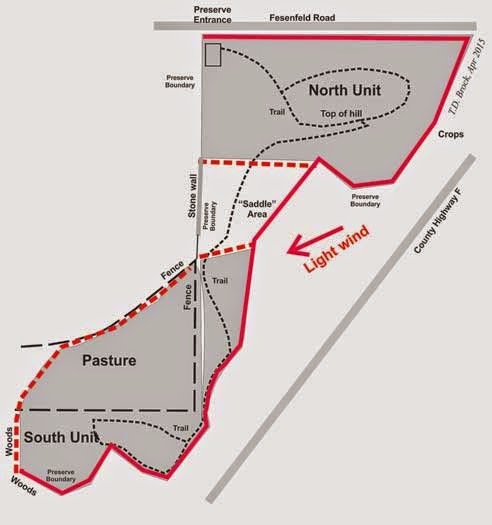 Because of the strange boundaries of the South Unit, this unit is burned together with the adjacent Pasture, which is not part of the Preserve. The whole Preserve is surrounded by crop fields, all of which had been harvested so that there was no danger of spot fires. The wind was out of the east and northeast and was fairly light, thus reducing the danger of spot fires. Lots of wetlining was done with the pumper unit on our Kawasaki Mule, so that the boundaries of the burn units could be well maintained. In the early years a few cows were pastured in this field, but by the time Kathie and I started managing this area it had been fallow for about 10 years. The vegetation then consisted of non-native grasses and sweet clover. We received permission to burn this field together with the South Unit, and this has been done now for at least 12 years. About three years after this Pasture was first burned, little bluestem became established on the east-facing slope, and has remained dominant since then. Later, other prairie plants started to move in, especially butterfly milkweed, which is prominent in the Saddle area. Recently, a wood lily became established and has flowered. This Pasture provides a good example of what can happen in a highly degraded remnant just from frequent burning. Prescribed burning in Wisconsin: Do you need a permit? We are in the midst of our spring burn season but scheduling has been maddeningly complex, since it has been hard to predict from one day to the next whether the state has canceled burns. More complicated, some areas of the state need permits and other areas do not. About 10 years ago I publised an article for The Prairie Promoter about burn permits in Wisconsin. There have been some important changes at the state level in how these burn permits are issued, so this Blog is a revised version of that article. Note that there are two kinds of permits issued. The important permits for those carrying out prescribed burns are for daytime burns. The other permit deals with burns begun after 6 PM in the evening and on relatively small acreages. Daytime permits require the submission to the regional forester of a prescribed burn plan. After 6 PM permits require simply the application to the local fire warden. Both types of burn permits are discussed below. Burning permits are required for controlled burns in some parts of Wisconsin but not others. The regulations on burning are quite complicated and there is considerable variation across the state. In general, it can be stated that regulations are most stringent in those areas that are predominantly forested. It is in these areas that the Division of Forestry of the Department of Natural Resources (DNR) has the responsibility for controlling forest fires. In the Wisconsin Statutes, the term “forest fire” means “uncontrolled, wild, or running fires occurring on forest, marsh, field, cutover or other lands or involving farm, city or village property and improvements...” (WS 26.11). This broad definition obviously covers the types of burning activities which concern restoration ecologists. As far as burning regulations are concerned, four types of areas in the state are recognized: intensive, extensive, cooperative, and municipal. See the map below for details. In Intensive Protection Areas the DNR is responsible for forest fire control. These areas are the most heavily forested and contain the most fire hazards and risk (red areas in the map). They have more DNR fire suppression resources and ranger stations. Fire detection is accomplished with fire towers, aerial detection, and citizen reporting. The most restrictive burning laws are in effect. These laws are regulated by the DNR and require a burning permit whenever the ground is not snow covered throughout the year. The Intensive Protection Areas are primarily in the northern part of the state. Also classified as intensive is a large area centered on Necedah. (See map) Note that in these areas burning permits are required at any time the ground is not snow covered, except inside incorporated villages or cities. Permits can be obtained from local emergency fire wardens and DNR field stations. The DNR is also responsible for forest fire control in Extensive Protection Areas. These are less forested than intensive areas and have fewer DNR suppression resources and ranger stations. Hazards and risk are still high in these areas. Fire detection is accomplished with aerial detection and citizen reporting. Burning is regulated by the DNR and except within incorporated villages and cities permits are needed whenever the ground is not snow covered from January 1 through May 31 (and other times when the department so orders). Daytime permits can be obtained from local emergency fire wardens and DNR ranger stations upon submission of a prescribed burn plan. Some parts of the state are not sufficiently forested and do not contain the hazards and risks necessary to warrant intensive or extensive fire protection. These areas are designated as Cooperative Fire Protection Areas. DNR ranger stations and suppression resources are not located in these areas. Town chairpersons have the responsibility for suppressing forest fires. This is accomplished through the local fire departments, with the DNR only providing technical and financial assistance. The town board regulates burning and restrictions vary throughout the state. Included here are vast areas of the state in the southern, south-central, southeast, northeast, and west central parts of the states. (White areas on the map) In these areas burning permits are issued by the town chairperson or other appointed wardens. There is great variability here in how burning is regulated. Many towns do not regulate at all and permits are not required. Some entities do not even want to be notified if a controlled burn is to take place. Suppression is carried out by the local fire department (rural or municipal). Burning permits may be required by local ordinances, and permits are issued by local government officials or fire departments, which should be contacted for information. Regulation of controlled burning may be stricter in cities and villages than in towns, although there is considerable variation across the state. In many cases incorporated areas regulate burning not because of potential fire hazard, but due to air pollution concerns. In the Intensive and Extensive fire control areas, the state is divided into a number of Fire Management Dispatch Groups (named in the county-by-county table below). These are groups named from the community in which the central office is located. Within each Dispatch Group, a number of separate Fire Response Units (FRUs) have been established. For instance, the Dodgeville Group has FRUs at Spring Green, Boscobel, Richland Center, and Poynette. Burning permits are issued at each FRU for locations in its area. As mentioned above, two kinds of burn permits are issued, one for fires started after 6:00 P.M., and one for daytime fires. Daytime permits must be obtained through the local FRU. These are issued based on submitted prescribed burn plans and can be written for the whole spring burn season. However, specific verbal authorization must be obtained on the morning of the day on which the burn is to be carried out. The authorization is obtained by telephone either from the responsible fire ranger or through the regional dispatch group. The rationale for the 6:00 P.M. permit is that in the evening humidity is generally higher and winds are lighter, making the burn less hazardous. Under most cases, an “after 6:00 P.M. permit” can be written by a local fire warden without prior approval of the DNR in the FRU. These permits are written for a whole year. 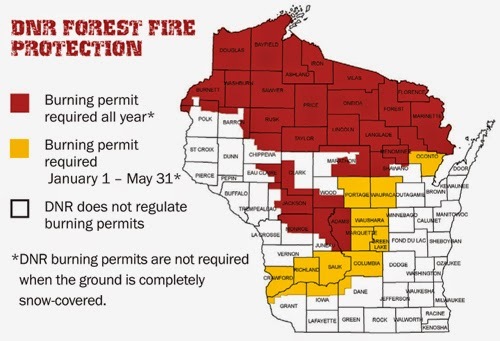 However, the holder must call the DNR hotline (1-888-WIS-BURN (947-2876) or access the burning restriction web site (dnr.wi.gov/wisburn) to ensure that burning is permitted on that day. Regulation is done on a county by county basis, and the information is updated after 11 AM daily. In cooperative and incorporated areas, the local fire department has the responsibility if a controlled burn gets out of hand. In intensive and extensive fire control areas, the local fire department works closely with the DNR to suppress fires. In all cases it is essential that the local fire department be notified ahead of time that a prescribed burn is to take place. In these days of widespread use of cellular telephones and the 911 emergency system, dispatching agencies occasionally receive 911 calls from citizens reporting not only wildfires but also controlled burns. Even if the local fire department has been notified ahead of time of an upcoming burn, it is still required to respond to a 911 call, but may not need to mobilize its full forces. No DNR burning permit required. However, the township may have its own permit system or other burning regulations. Check with the Town Chairman. Burning permits required from January 1 through May 31 whenever the ground is not snow covered. Burning permits required all year long whenever the ground is not snow covered. A large amount of information on the DNR forest fire program is available on the DNR web site. This link is a useful entry point. This web page provides a county-level table and map of the whole state. By clicking on an appropriate area one can determine how that area is regulated and obtain telephone numbers and other information. I have summarized in the table below the information from this web site for the whole state on a county by county basis. This table is only intended to give an overview. It is strongly recommended that the DNR web site be accessed to obtain specific information on a particular county, or part of a county. If the area to be burned is within one of the Dispatch Groups, the web site will give telephone numbers where further information can be obtained. Note that some counties have split designations so that parts may be under DNR control and others are only under local control. The map above shows those counties. For instance, in Dane County only a few townships in the northwest part are under DNR control: Berry; Black Earth; Mazomanie; Roxbury; and Vermont; with only a small part of Blue Mounds (north fragment only). All other townships in Dane County are under local control. Those under DNR control are heavily forested. The table below should be consulted for information on a specific county.